Eastern Orthodox Spirituality: Why Did the Holy Spirit Appear as Fire? Why Did the Holy Spirit Appear as Fire? You have heard that the Holy Spirit descended upon the disciples in tongues of fire. But why did the Holy Spirit, co-eternal with the Father and the Son, appear as fire? Why as tongues of fire? Why does He sometimes appear as a dove and at other times as a flame? Why did He descend as a dove upon the Only-begotten Son, but as a flame upon the disciples? The Holy Spirit appears as fire because, in the words of the holy Apostle Paul, God is an ethereal, indescribable, and invisible fire: “For our God is a consuming fire” (Heb. 12:29). God is also called fire because He destroys the rust of sins. But the Lord sends fire down to earth when with the breath of the Holy Spirit He enflames the hearts of mortal men. And the earth lights up when a heart of flesh, that is cold in its iniquitous pleasures, abandons the desires of the modern world and becomes enflamed with love for God. Thus the Spirit very properly appeared as fire, because from every heart in which He chooses to dwell, He dispels the numbness of ice and enflames such a heart with a desire for eternal life. And the reason He appeared in tongues of fire was because the Spirit is co-eternal with the Son, while the Son is the Word of the Father; thus, just as the tongue is in close proximity to the word, so the Holy Spirit appeared in flaming tongues, in order to show the Spirit’s particular closeness to the Word of the Father. Furthermore, the Spirit also appeared in tongues of fire because He causes everyone in whom He dwells to be ardent and cogent. Church teachers possess tongues of fire, because in their sermons on the need to love God they kindle the hearts of their listeners. This flame was acquired from the mouth of the Lord Himself by those who said: “Did not our heart burn within us, while He talked with us… and while He opened to us the Scriptures?” (Luke 24:32), because from the spoken word the spirit is kindled, its cold rigidity is dispelled, the soul begins to burn with lofty aspirations, and distances itself from earthly desires. Celestial commandments are never heeded with a cold heart, but with a heart burning with the fire of inner love for them. The Holy Spirit appeared both as a dove and as fire, because He makes all those whom He encompasses both pure and ardent – pure as a dove and fiery in their ardor. Such a combination of ardor and purity is the only one acceptable to God. Thus, since the Spirit teaches both righteousness and purity, He had to appear as a dove, so that every heart touched by His grace would be tranquil with meekness and fiery with ardor for the truth. 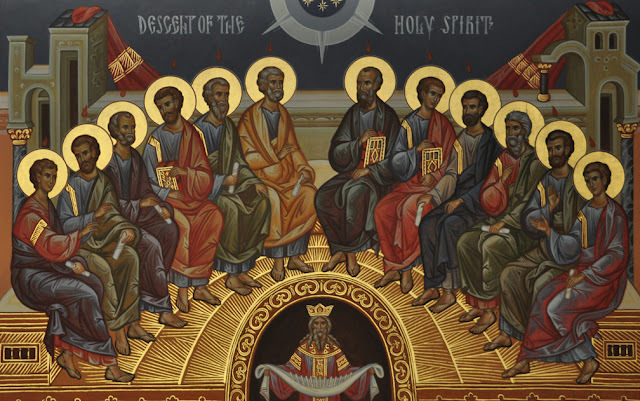 Yet why did the Holy Spirit appear as a dove over our Redeemer, our Intercessor between God and men, but upon the disciples He descended as fire? It is well-known that the Only-begotten Son of God is the Judge of mankind. But who could have borne His judgment if He, before gathering us together in meekness, had judged our sins with ardor for truth? Thus, having made Himself Man for the sake of men, He appeared meek before men. He did not want to destroy sinners, but wished to gather them to Him; He wished first to rectify them through meekness, in order to have with Him those who could later be saved on the Day of Judgment. For this reason the Holy Spirit appeared as a dove over the One Who came not to destroy sinners through ardor, but to bear them a while longer through meekness. On the other hand, upon the disciples the Holy Spirit had to descend as fire, so that they, being plain people and even sinners, could spiritually enflame other slaves of sin to rebel against their sins and to cleanse by means of repentance those sins which God had spared through meekness. And the fact that even adepts of the Heavenly Teacher are not without sin is confirmed by St. John, who says: “If we say that we have no sin, we deceive ourselves, and the truth is not in us” (1 John 1:8). Thus the Holy Spirit descended as fire upon people and as a dove upon the Lord because we, in our ardor for truth, must carefully notice and burn with the fire of constant repentance those of our sins which the Lord mercifully bore through meekness. Consequently, the Spirit appeared over the Redeemer in the form of a dove and over people in the form of fire, because the more moderate is our Judge’s strictness towards us, the more must our weakness be enflamed against its own self.